MACCT is located at Saint Martin le Beau, in Touraine Indre-et-Loire, very nice place in the center of France, known in French as "Jardin de la France" the Garden of France, Valley of kings, bathed by the Loire and the Cher rivers. You will be welcomed and you will enjoy your stay in Touraine. .
Paris and MACCT airfield are approximately 200 kms distant. Located at the North-South/East-West motorway junction : the A10, the A85 and the A28. 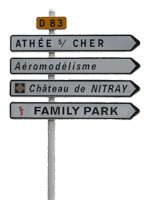 --If coming from Paris, take the A10 and exit at AMBOISE. 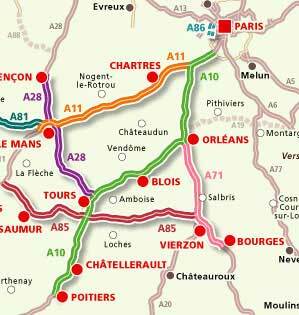 -If coming from Bordeaux (South West of France) take the A10 and exit at "TOURS CENTRE"
-If coming from NANTES (west of France) or from LYON (east of France), take the A85 and exit at "Bléré". 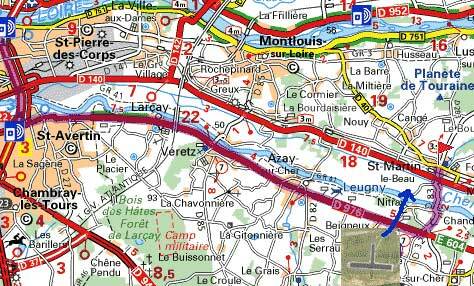 -If coming from "LE MANS" (west of France) take the A28 and exit at ST AVERTIN. 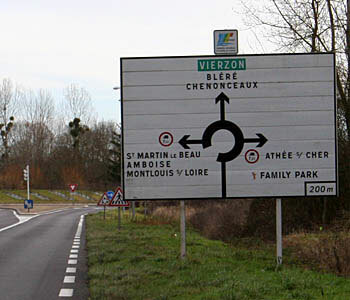 From TOURS to ST MARTIN LE BEAU, take the D976 or the D140, while following the direction VIERZON. You are arrived, good flights.